The Fourth Most Dangerous Mistake Any Christian Can Make Is To Believe That We, As Christians, Are Not To Judge Anything or Anyone. That deception is so rampant in the church can be primarily attributed to just one underlying fact - the vast majority of Christians today are Biblically illiterate. 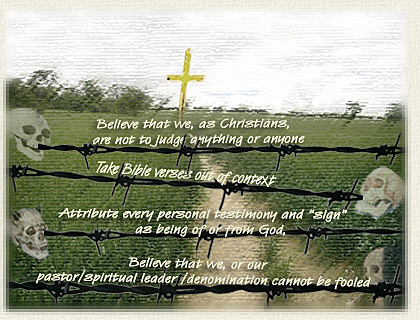 1) Believe that we, or our pastor/denomination/spiritual leader cannot be fooled, 2) Attribute every personal testimony and “sign” as being of or from God, 3) Take Bible verses out of context and 4) believe that we, as Christians, are not to judge anything or any one. Not necessarily in that order. Thou Shalt Not Judge! ... 11th Commandment Or Politically Correct Liberal View? "Judge Not" - Judging in General, Or Certain Types Of Judging? Judging is Far From Being "Unchristian"
Christians seem to have missed many, many instructions in Scripture that can not be followed without judging. All too many Americans believe that one has to accommodate whatever anyone else believes - even if it contradicts the facts / makes absolutely no sense whatsoever. If you dare claim that what another person believes to be true is, in fact, wrong, you are accused of being intolerant and judgmental. To determine or form an opinion or estimation after consideration or deliberation. Which means that when a person is told not to judge, they are being told that they should not consider and evaluate the evidence. How then we are to arrive at sensible conclusions regarding what we are to believe, or which path we are to follow, is anyone's guess. In fact, regardless of often mealy-mouthed protestation to the contrary, we have to make judgments every single day of our lives. If we have an ounce of common sense we do not make important decisions such as what job to take, what car to buy, which insurance company to go with, or which candidate to vote for without doing the appropriate research - and make our decision based on a careful evaluation of the evidence we gather. And that process is called 'judging'. While it is certainly true that we can be fooled by someone or something, poor decisions can often be attributed to ignorance, a lack of understanding, and/or insufficient thought and deliberation. Yet, how often do we hear one person telling another not to judge..
"Judge Not"- Judging in General, Or Certain Types Of Judging? By the way, the irony of the situation is that those who quote this verse are not at all averse to judging (and condemning) your right to "contend earnestly for the faith", or simply your right to say what you believe to be right and wrong. Those who quote the 'judge not" statement perfectly illustrate the old saying... "a little knowledge is a dangerous thing" because the Bible does not condemn judging in general, but points out that certain types of judging is wrong. The First Kind of "Wrong Judging" Is To Judge Hypocritically. The fact is, that "Judge not, that ye be not judged" is not a stand alone statement that Jesus pulled out of thin air, then went off to try his hand at fishing for his lunch on the Sea of Tiberias, saying no more on the matter. In fact, it has been terribly wrested from it's context. Perhaps we should allow the Lord to complete His thought AND His sentence. Read in context, it becomes clear that Jesus wasn't saying or even implying, that we should never make judgments about anyone, at any time. In fact just a couple of verses later Jesus Himself called certain people "dogs" and "swine" (7:6), and "wolves in sheep's clothing" (7:15). Nor was He telling us that the other person does not have a problem that needs to be taken care of. He was instructing us not to judge hypocritically. That we have to "take the log out of our own eye" BEFORE removing the speck from our brother's eye. The Second Kind of "Wrong Judging" Is To Judge According To Appearances Or Material Possessions. A Third Kind of "Wrong Judging" Is To Judge On Matters Of No Importance. There are several verses in the 14th chapter of Romans in which Paul seems to emphasize that Christians should not judge each other. In fact, Rick Warren used verse 4 in his book, The Purpose Driven Life, saying.. However, a careful reading of the context indicates that in this chapter Paul was addressing misunderstandings between the Jewish and Gentile Christians in Rome, inasmuch as the Gentiles completely disregarded certain customs that the Jews held sacred. Issues that had aroused friction were whether it was lawful to eat meat that was offered in sacrifice to idols; (V. 2). Whether days of fasting were to be observed (Vs. 5-6). And whether some certain animals were clean or unclean (V. 14). from which people who read no further, get the impression that since none of us are without fault, none of us are in a position to cast stones at anyone else. But that is not the end of the story. By this time the religious leader were fully aware that Jesus had compassion on sinners and would not wish to to condemn the woman. But if He did not pass sentence, He would be seen as contradicting Himself when He said that He had come to fulfill the law, not abolish it. (Matthew 5:17-18). They thought they had Jesus trapped, but how little they knew about our Lord. He did not deny the woman's guilt, and did not ask for mercy for her. He simply asked one question ... who will cast the first stone? The Pharisees understood the subtle warning that they too were sinners and very vulnerable. They gradually melted away leaving the woman alone with Jesus who told her she was free to go. However, He also urged her to forsake her sin in the future . This can be phrased in a number of ways... Who left you in charge? Who died and left you boss? Challengers are also often referred to as "heresy hunters" in an effort to disparage them. However I am reasonably sure that few people actually go hunting for heresies in the church. Besides which, as the days grow more and more dark, it is highly unlikely that the Lord has stopped appointing watchmen and holding them accountable. These watchmen are not afraid to stand up and challenge false teachings. However, when they do, they often run into those who want to know what right they have to challenge their doctrine. This completely daft response attacks the challenger instead of the objection raised. Note: If the challenger were to have said "you are wrong because I said so", the who are you to say response would be a valid one. There's a world of difference between "listen to me", and "listen to my argument". Note: Although this issue came up some years ago, I have left it here simply because it a classic example of how so many respond to challenges by denigrating the challenger. "self-appointed attack dogs of Christendom" who "seem determined to savage not only opponents of Christianity, but also fellow believers of whose doctrinal positions they disapprove". A troll through the Internet reveals websites so drenched in sarcasm and animosity that an agnostic, or a follower of another faith tradition interested in what it means to become a Christian, might be permanently disillusioned. None of the major figures of American Protestantism in the past quarter-century have been spared from attack, from Billy Graham to Rick Warren, from Tim LaHaye to Robert Schuller. The attacks, moreover, are not reasoned or modestly couched criticism, but blasts of ire determined to discredit beyond redemption the targets of the criticism. What is astonishing is that in a short scathing article Aikman relegates pastor Cloud and his years of research and study to the dustbin of "heresy hunters". He completely ignored the substantial research and doctrinal arguments that usually goes into the reports of those issuing public warning against the teachings of other Christians. He never ever demonstrated where they are wrong according to the Scriptures. He instead chose to attack the ministry itself for comparing what is being taught in some churches with the Word of God. While Aikman never quoted the Bible, he did quote atheist Sam Harris, whose 2004 bestseller The End of Faith, sparked what he called vitriolic e-mails and letters from Christians. Harris added that the most "disturbed" of his correspondents "always cite chapter and verse." In other words, Aikman can call other Christians "attack dogs" but if they criticize at all, they must do so with grace. I am afraid I see little "grace" in Aikman's language. To say that a preacher should not publicly warn of error flies in the face of Scriptural teachings and examples. In fact, Scripture commands various people, at various times, to reprove, rebuke, and to earnestly contend for the faith once delivered to the saints. When dealing with the Pharisees, who were respected religious leaders of the day, Jesus' language can only be called 'harsh'. He called them hypocrites, children of hell, blind guides, fools and blind, serpents, and a generation of vipers. Sadly, His words equally apply to far too many religious leaders of today. And, as the incident at the temple shows, Jesus' words were followed by action. That's about as judgmental as it gets. John The Baptist was not exactly polite when he saw the religious leaders making their way to his baptism. In practically every epistle he wrote, Paul issued strong warnings against error. Note how often he unhesitatingly names the person concerned, and how much 'intemperate' language he used. The "apostle of love" did not mince any words when speaking of people who claimed to know Jesus, but did not obey Him. He flat out called them "liars". Finally in verse 22, Peter says that according to the proverb, these dogs turn again to their own vomit and wallow in their own mire. If judging others is as unchristian as it is often made out to be, I have to ask how we will "Abhor what is evil; cling to what is good" (Romans 12:9) if we cannot tell the difference. Also try obeying any of the following without doing some judging.. In fact... why are we forgetting what exactly is at stake here. Even if we were talking about the presidency of the United States, as important a position as that may be, no matter how big a duffer we manage to elect, we have the consolation that he can be gone in four years, and his nonsense will hopefully be corrected by the next person. However, when the issue is spiritual matters, we are not talking about four years or having to get rid of that lemon we bought. We are talking about a life and death situation from which there is no going back. Either men will live in God's kingdom for all eternity or be condemned to death for all eternity. The Greek "diakrisis" is derived from diakrino - to separate thoroughly, discern, doubt, judge. In other words, one of the gifts of the Holy Spirit is the ability to judge or determine between two things as to which is right and which is wrong. We had better start rethinking our position on being "judgmental", because the big judgment that all of us are going to face in the not so distant future is going to be made by someone who couldn't care less about being 'politically correct'. His only basis for judgment is going to be whether or not we have obeyed His Word and is going to hold us accountable for what we have ourselves done or have allowed in our churches. While I am not saying that, by reason of his accomplishments, David Cloud is an infallible authority on all things spiritual, he is not exactly a fool with a computer and an internet connection. He and his wife Linda have been missionaries to Nepal since 1979 and have started churches, Bible Institute, and a radio program. He is also the Director of Way Of Life Literature and the publisher of O Timothy magazine. One of David Aikman's book is Great Souls: Six Who Changed a Century, an examination of the lives of six morally exemplary figures of the 20th century: Mother Teresa, Pope John Paul II, Aleksandr Solzhenitsyn, Billy Graham, Nelson Mandela, and Elie Wiesel. Billy Graham was quoted as saying.. Mother Theresa believed Hindus could go to heaven if they believed sincerely in their gods. That Hindu ceremonies, along with other interfaith ceremonies were conducted at Fatima [Details]. And on and on without end. Rick Warren: I also don't think Rick Warren is a "milquetoast" as Ken Silva of Apprising Ministries is supposed to have called him. The word milquetoast means 'one who has a meek, timid, unassertive nature'. Rick Warren is far, far worse, having done more than his fair share to lead Christians down many wrong paths. However I certainly agree that Robert Schuller and Norman Vincent Peale are unquestionably "the devil's duo", having introduced innumerable occult concepts AND literature into the church. While Brian McLaren. and Joel Osteen are without question "vipers of new evangelicalism" and "whitewashed tombs." Joel Osteen has been all too happy to carry the banner first raised by Norman Vincent Peale and Naploean Hill (and make himself tremendously rich in the process). An October 21, 2005 article By Tatiana Morales on CBS News.com refers to an appearance Osteen made on The Early Show on which co-anchor Harry Smith ..."compared Osteen's preaching to Norman Vincent Peale's, and Osteen agreed". The problem is that Norman Vincent Peale's The Power of Positive Thinking, not only displays an unmistakable resemblance to the philosophies of Napoleon Hill, but he even used one of Hill's hallmark expressions.. conceive and believe, which was in turn used by Osteen. The wording in all three of the books is virtually identical. And, where did Napoleon Hill get his ideas? He was vastly influenced by an "imaginary cabinet" and his conversations with actual unseen beings. [See Section on Joel Osteen in article on the Prosperity Doctrine. Also Roots of Evil, which charts the migration of occult literature and doctrine into the so called church]. David Cloud, Christianity Today's Cheap Shot At Biblical Warning Ministries. August 28, 2007.